The strong economy is reaching all corners with employment rates and household incomes rising. One result is households are feeling pretty good right now. Balance sheets have been repaired. Debt, while rising, is in line with income gains, meaning there is no massive buildup like last decade. More importantly, given low interest rates in recent years, the payments to service the debt are at or near historic lows. All told, consumer sentiment is as high as it was at the peak of the 1980s and mid-2000s expansions, although a bit lower than in the late 1990s. One result of this is discretionary spending as picked up in recent years. Overall consumer spending is roughly in line with income growth, meaning the savings rate is holding fairly steady. But we have seen a shift in the types of things consumers are buying over the last couple of years. In particular there has been strong gains in what I call entertainment spending. This includes admissions to events and activities, gambling, going out to eat and on vacation. These types of activities are discretionary and are growing more than one percentage point faster than income or overall spending in recent years. Obviously households don’t need entertainment to survive, although it does bring us joy, and more often than not sports-related heartbreak. It does appear that the strong economy, which drives household finances, is now translating into increased discretionary spending. This likely bodes well for holiday shopping in the immediate-term, but also for these types of businesses through the rest of this expansion. Two final items. 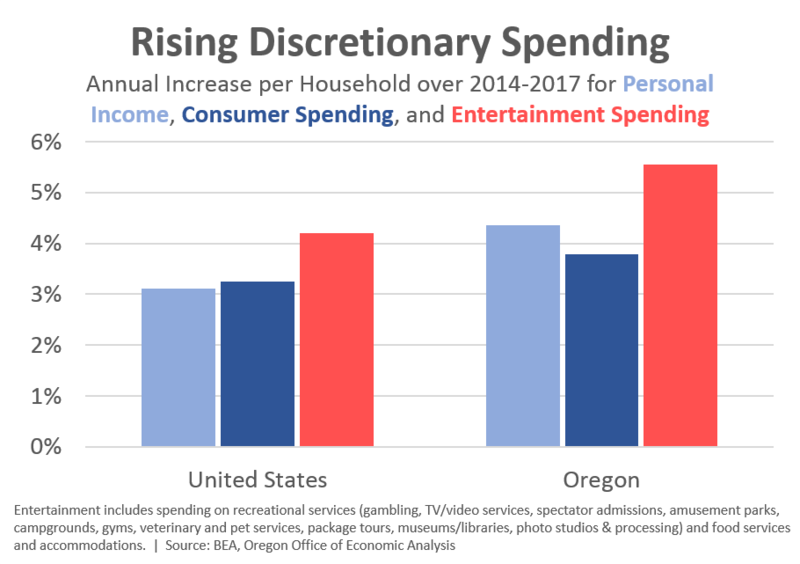 First, one could argue that a good chunk of this pick up in entertainment spending is the result of lower energy/gasoline spending in recent years, with an even more pronounced decline in Oregon. Given oil prices are somewhat higher today, expected growth in discretionary spending won’t be quite as strong as in 2015 or 2016. Second, spending patterns vary within this broad entertainment category. One particular, discretionary activity our office tracks is gaming given we forecast revenues for the Oregon Lottery. Stay tuned for an update on the gaming outlook in the near future.